Trading hours are Monday - Monday, 08:00 till 17:00 at the Tolbos Resaurant. Hetsie can, however, be reached after 17:00 on her mobile. Both trails are self drive, trips take place daily. The exciting Gonjah 4 x 4 Route is a fabulous way to explore and discover the gorgeous area of the Gamtoos River Valley in the Eastern Cape. This area borders the Baviaanskloof region, which is one of this province’s most prized natural jewels and tourist attractions. The natural appeal of this area lies in its abundance and diversity. There are rolling hills, deep gorges, lush forests, and looming mountain ranges that all add to the awe-inspiring beauty of Gonjah and its surrounds. Traversing the challenging 4 x 4 routes of Gonjah will give visitors the opportunity to experience the rejuvenating power of Mother Nature. There are two 4 x 4 routes, one having made the Baviaanskloof area renowned amongst national and international adrenalin junkies. The routes are 16 kilometres and 20 kilometres long and take three and five hours to complete, respectively. A number of fauna and flora species can be seen along the way, including plenty of antelope and birds. 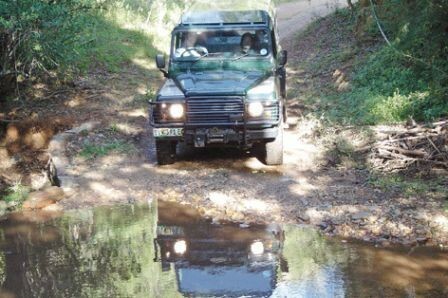 Other activities near the Gonjah 4 x 4 Route include freshwater fishing, cycling, golfing in Hankey, and hiking. Gonjah unfortunately does not allow any animals because our chalet, campsite and 4x4 route is situated in a private game “reserve” (privaat wildkamp).